Opening hours Venice - detailed information. Shops, restaurants, pharmacies, banks, museums and other opening times in Venice. Venice is a tourist city. The opening hours depend on the needs of the guests. There is less and less legal regulation of opening hours in Italy. Similar like in many countries, there is a tendency to close later and later in the evening and open longer on weekends. The opening times in Venice depend on the location, type of shop and size. Normal shops for the locals open in the morning from 9 to 13 o'clock. This is followed by a longer break (siesta). In the afternoon evening is opened again from about 15 o'clock to 19:30. These times are not fixed. Some shops open already at 8:30 or close only at 20 o'clock. In general, the shops determine their opening times more and more themselves. Also in Italy the shop closing laws are getting less, above all in regions with much tourism. Sunday is usually closed, many shops are also closed on Saturday afternoons. Smaller shops can also be closed on Monday mornings. A little less shops are closed on Wednesday mornings or afternoons. Larger supermarkets often have no lunch break. This is not the case for all supermarkets. Medium sized grocery stores on the mainland often have a 2 hour break in the early afternoon. The more touristy the area, the more likely it is that a shop will not have a lunch break and will also open on Sunday. In the big tourist areas in the old town, as in the main alleys between Santa Lucia station and Rialto bridge, Sunday is a normal working day. 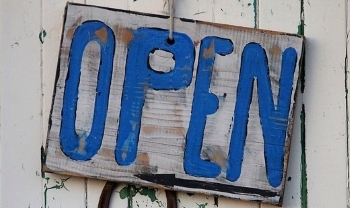 Almost everything, whether souvenir shop, bakery or clothing shop, is open on Sundays. Similarly, in areas where the majority of customers are foreign tourists, lunch breaks are often not taken. In the meantime, the majority of supermarkets in mainland Venice (such as Mestre and Marghera) are also open all day on Sundays. Such Sunday opening hours apply, for example, to the huge Spar in Mestre or the popular Lidl in Marghera. However, this does not apply to all holidays. Some "Supermercado" have only a few days a year closed, on important holidays like Christmas, New Year and so on. Some shops also have longer opening hours in summer than in winter. This is especially true for shops whose customers are mostly tourists. Also, most supermarkets in the old city of Venice are open on Sunday at least in the summer. This also applies to many smaller corner shops that are often run by immigrants in Italy. The two large shopping centers on the mainland have opened extremely long. The opening times are in the shopping centre Porte di Mestre and in the Nave de Vero Marghera about every day from 9 to 21 o'clock. It is only closed on some important holidays like Christmas. Generally in Italy holidays are considered more important than Sundays. Shops that are open on Sundays are often closed on important public holidays. Some large supermarkets and shopping centres in Venice and Mestre are now open on Sundays, often with limited opening hours. Even the only department store in the old town we know called Coin has opening hours 7 days a week from 10 am to 8 pm. Many big and important museums in Venice are open from 9 to 19 o'clock. Most of the big museums do not have a rest day. A smaller museum in Venice may have much shorter opening times. You can also visit them only 6 days a week. It is not rare, as everywhere in Italy and Europe, that the museum is closed on Monday. But there are also exhibitions and museums that are closed for example on Sunday or Tuesday. 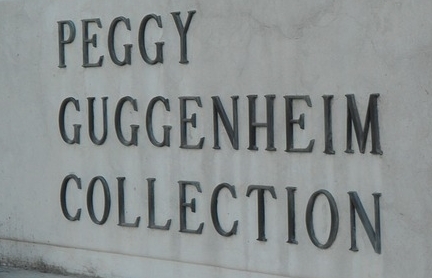 For example, the Guggenheim Art Museum is closed on Tuesdays. The opening hours of the restaurants in Venice are very different and depend on the needs of the guests. 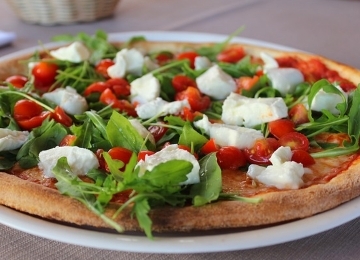 In general, one can say that the gastronomy in Venice starts relatively early. Many restaurants open already at 10 a.m. or even earlier. In the evening, many restaurants close around 22 o'clock. Some have a siesta, others don't. The night life on the island Venice (Venezia Centro Storico) is not very big. It is not easy to find a pub or a caf� after midnight. Night owls have slightly better chances on the mainland, for example in the centre of Mestre. There is also a lot going on at night on the island of Lido in summer. Banks have slightly different opening hours in Italy than in England or the USA. They are not exactly the same for every bank. The banks usually work in the morning from about 8:30 a.m. to 1 p.m. or a little longer. In the afternoon there is a short opening, many banks only for one hour. Saturdays, Sundays and public holidays are closed. Frequent opening hours for banks in Venice are: Mon - Fri 8:30 to 13:30 and 14:30 to 15:30. The large post office at the Rialto Bridge (Campo San Bartolomeo) has long opening hours: Monday to Saturday 8:30 to 18:30, Sunday and holiday is closed. Other post offices open much shorter than the main post office in the centre of Venice. Pharmacies in Italy usually have a longer lunch break. Typical opening hours are from around 9 am to 12:30 pm and from 3 pm to 7 pm. Not all pharmacies are open on Saturday afternoons. As in many countries, there is also a system of pharmacies in Italy for emergencies that are open at night and on weekends. In the shop windows of most pharmacies there is a sign with the next open pharmacy in the area. The Italian word for pharmacy is "farmacia". The opening hours are very different. Some cost admission, others don't. On Sundays the opening hours are often reduced due to church services, among other things. 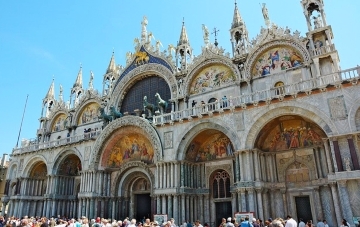 The Basilica of St Mark (Saint Mark's Basilica), for example, can be visited during the week from around 10 a.m. to 5 p.m., on Sundays only for 2 hours in the afternoon. The large church Santi Giovanni e Paolo (San Zanipolo) has significantly longer on (opening time about 7:30 to 18:30, entrance fee 2.50 euros).